Every child loves something on their bedroom wall and with Mister B’s room looking rather bare at the moment, we’ve been keeping an eye out for some kind of wall art to give it a bit more character. Walls of the Wild are a collection of beautifully hand painted images that are reproduced onto a self-adhesive, peel and stick polyester. They include ranges such as birds, plants, underwater, jungle and something that would have great appeal to Mister B – dinosaurs! 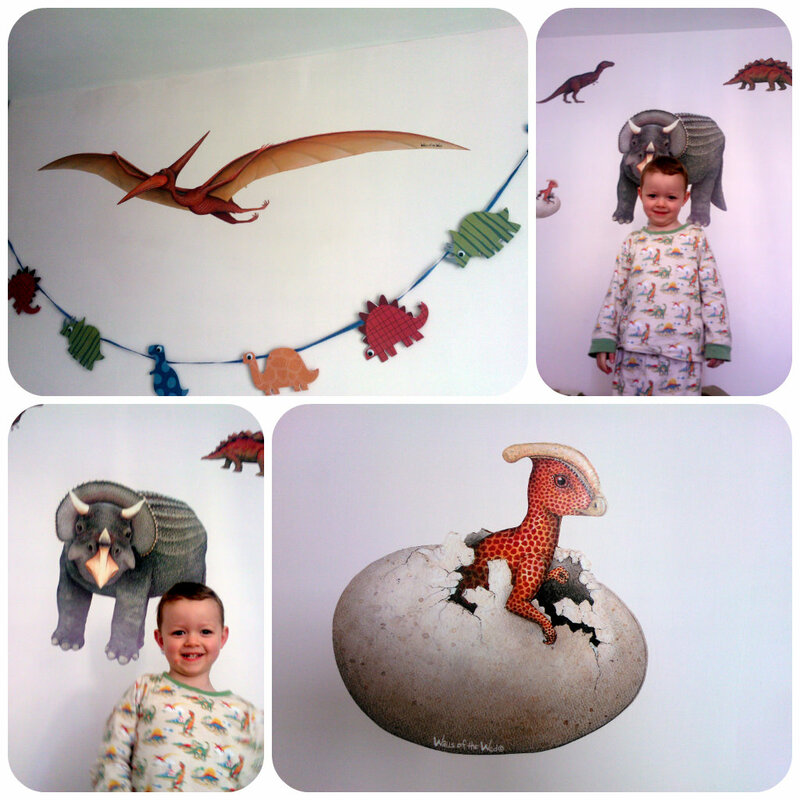 We received a selection of dinosaur wall stickers from Wall of the Wild to try out and couldn’t wait to get them up on the wall. They are very sticky so adhere to the wall very easily, and can be removed if required. It’s easy to smooth them out and create a flawless finish. The only one we did find a little tricky was the large Triceratops, which being such a large sticker did require a little more time and care to apply smoothly. The Walls of the Wild stickers are a peel and stick polyester which gives a seamless finish to the wall. The designs were originally hand painted by artist Dede Lifgren before being reproduced into wall art. The detail in the picture is fantastic and creates life like images that truly look painted onto your own wall. If I had the time it would have been great to paint a background scene on which to place the dinosaur stickers! I think they look truly fabulous and so seamless to the wall. My personal favourite is the Pterodactyl with it’s wide swooping wings. This looks really stunning on the wall, although I have to say my photos do not do these stickers justice. I catch a glimpse of it every time I walk past Mister B’s bedroom door and always have to take a second look. So what did Mister B think? Well he already has dinosaur duvet covers, storage boxes, model dinosaurs, and dinosaur pyjamas, so when he saw his newly decorated bedroom his little face just lit up into a huge grin! 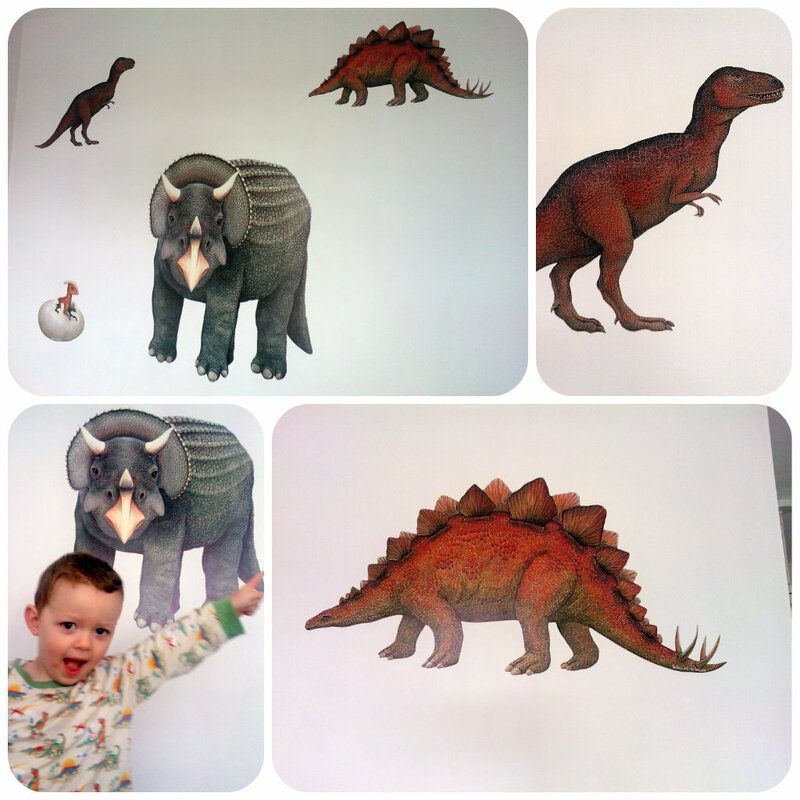 The dinosaur stickers from Walls of the Wild have been a big hit with us. We would thoroughly recommend them for their quality. They are a little expensive compared to other stickers I’ve seen but with a combination of the artwork and durability I think it’s a case of you get what you pay for. They are well worth a look.